Gissel Garcia is a 17 year old senior that attends Birmingham Community Charter High School. She is the Managing Editor for the Patriot Post. She loves to be called "Gigi." She is a student athlete on the wrestling team and her future goal is to become an elementary teacher. Gissel has always had a heart for kids and her personality describes exactly how she would be a great elementary teacher. After her two year at Santa Monica college she will transfer to a university and get her teaching license. You will always see her with a smile on her face, and if not, then she has homework due the next period. Gissel loves all the activities she takes on at school. Although she does a lot, she always makes time for the people she finds important. She may seem like an aggressive over-achiever, and she is, but she is also a energetic heart-warming person. Her favorite hobbies are practically anything featuring adrenaline. So if you take her out, make sure you're okay showing people your crazy friend. She has an obsession with ice cream and strawberries. Ironically, her favorite ice cream is not strawberry ice cream, but cookie dough! Her years at Birmingham have been everything any high school student would dream it would be. She has joined many clubs, gone to many games, played many sports, and participated in anything you could name. When she was a freshman, her elective was theater, and after that she was fond of creative arts and later would choose her academy as Performing Visual Arts (PVA). 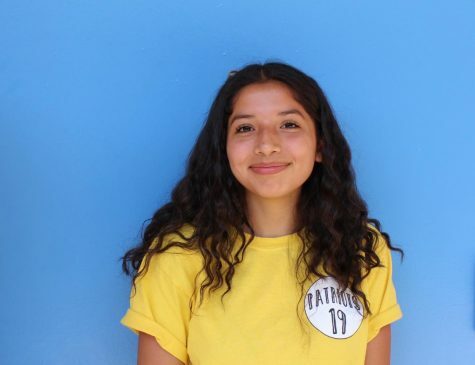 She loves the PVA Academy because there are many creative things to choose from and if you had ever met her, you would know how outgoing she is and that the PVA Academy suits her very well. Gissel is an extraordinary complicated girl that you would never want to change.